Jul 24 2015: We're in the Arctic now! It dipped to single digits last night, and we were dreading what kind of weather we'd see when we woke up. But in the morning, we strained to hear the patter of rain on the tent. A look outside confirms it. No rain!!! It's still fairly cool out, so we'll have to continue wearing our rainsuits, but I can sense this will be a good day for travel. 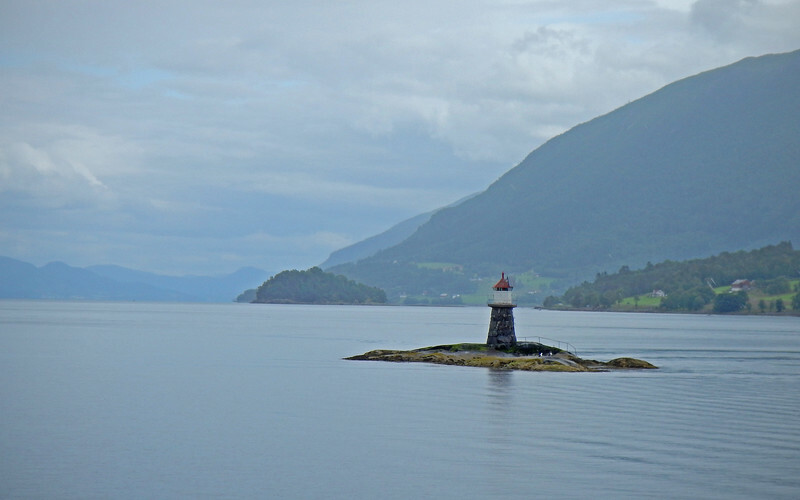 What better way to start off the day than with a brisk ferry ride - Afanes to Solsnes. We get the top level all to ourselves! View from our perch on the ferry. Cloudy, but at least it's dry! 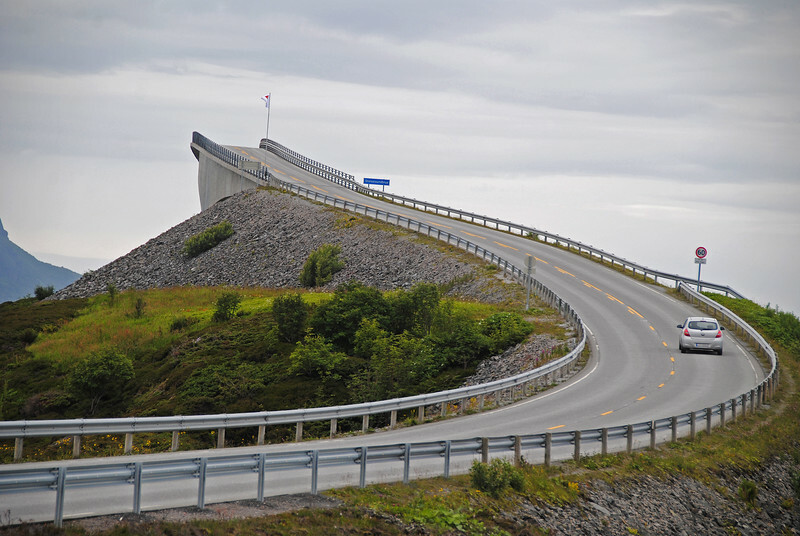 Today we're going to spend some time on the Atlantic Road. 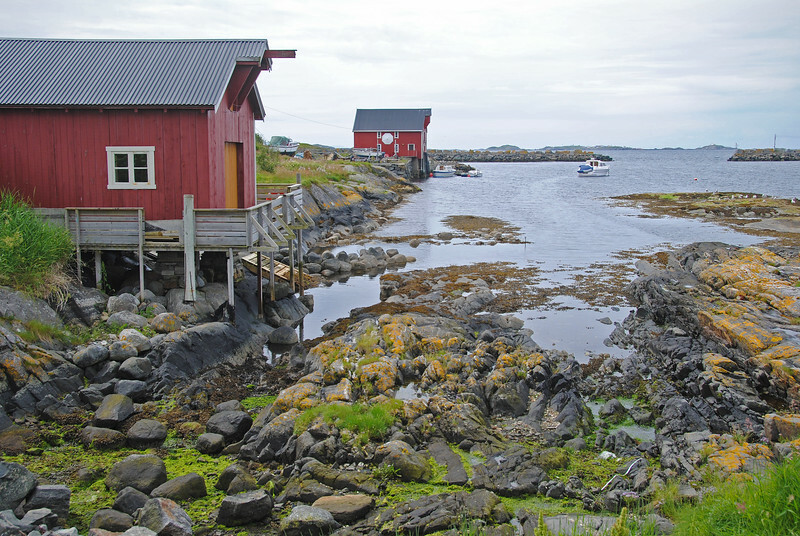 It's only an 8-km stretch of road right along the Atlantic coast (duh) that's supposed to run through some quaint Norwegian seaside villages. 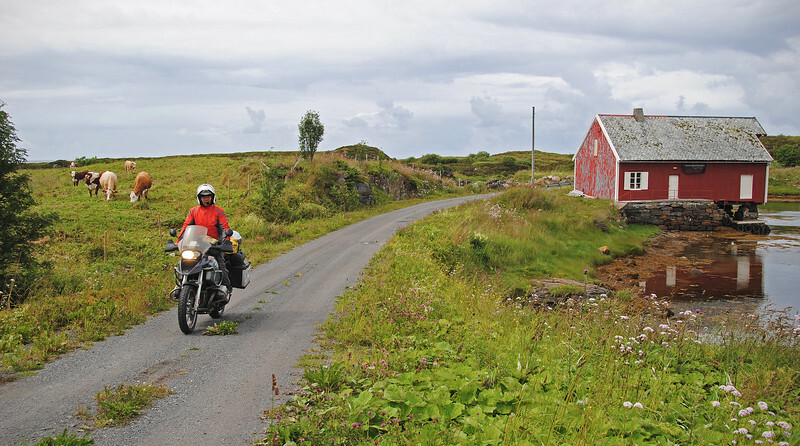 The scenic route is really out of the way, our GPS keeps wanting to route us back to the main highway, so we follow the clearly marked tourist signs that point us to the "Atlantic Way". 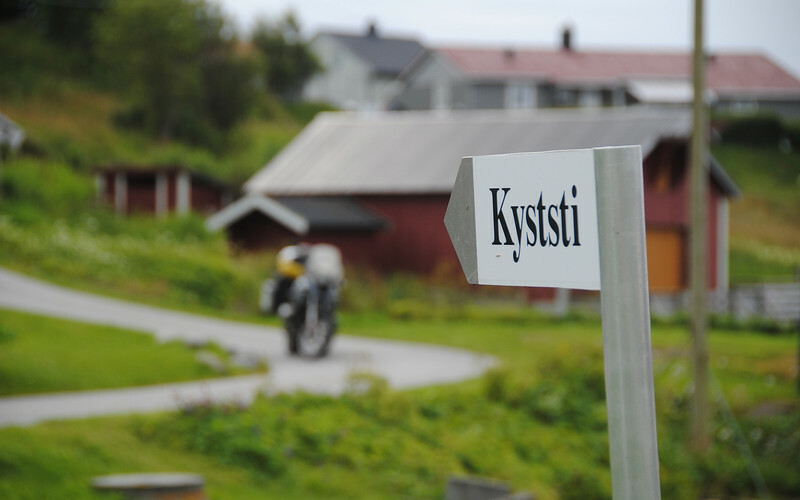 Then I found out that Kyststi means "coastal road" in Norwegian... Silly me. I feel kind of ashamed that we've learned no Norwegian words while we're here. But in our defense, everyone speaks English! 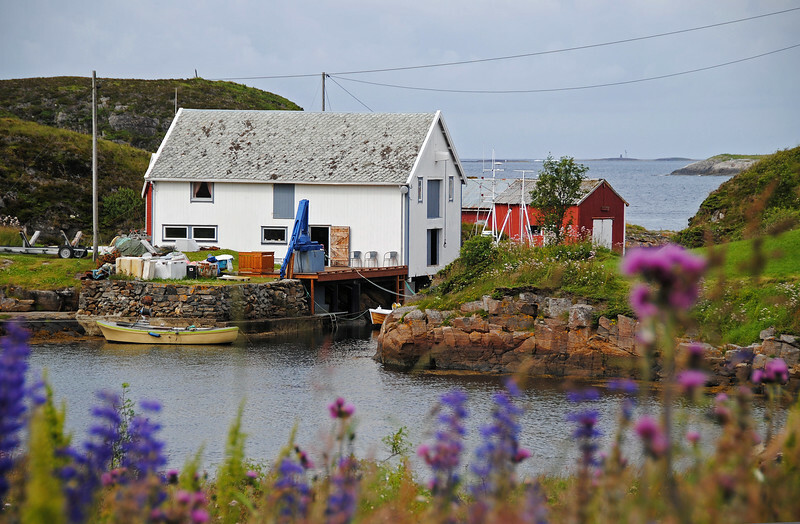 Neda finds a small grocery store in Bud, which is a town at the start of the Atlantic Road and I go exploring the tiny village by myself and to take some pictures. Absolutely no one around, so I park wherever I want. I return to the grocery store to rendez-vous with Neda. We took turns updating each other. I was showing her my pictures and she was telling me how super-expensive the groceries were. She revealed to me the most outrageously priced item that she saw - a single red pepper that they were asking for €6! WHAT? I know they don't grow these in Norway and they have to import them in, but seriously, $10 for one red pepper?!? 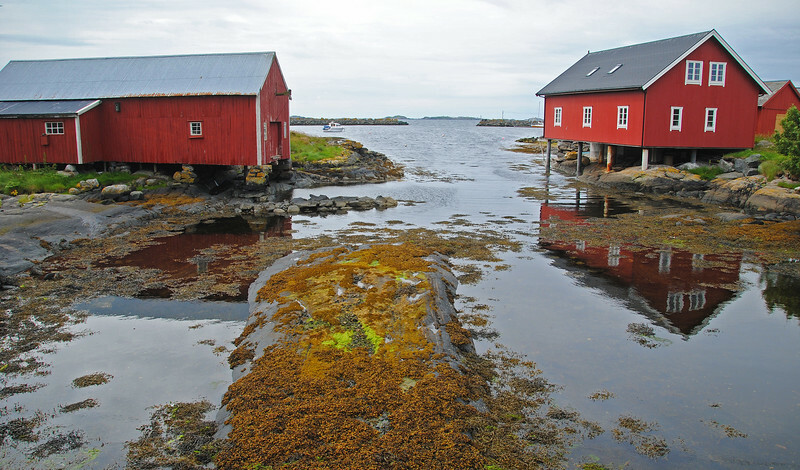 I think by Norwegian law, you have to paint your boathouses rust-red. There is a hefty fine if you don't - they make you buy a bag of red peppers. 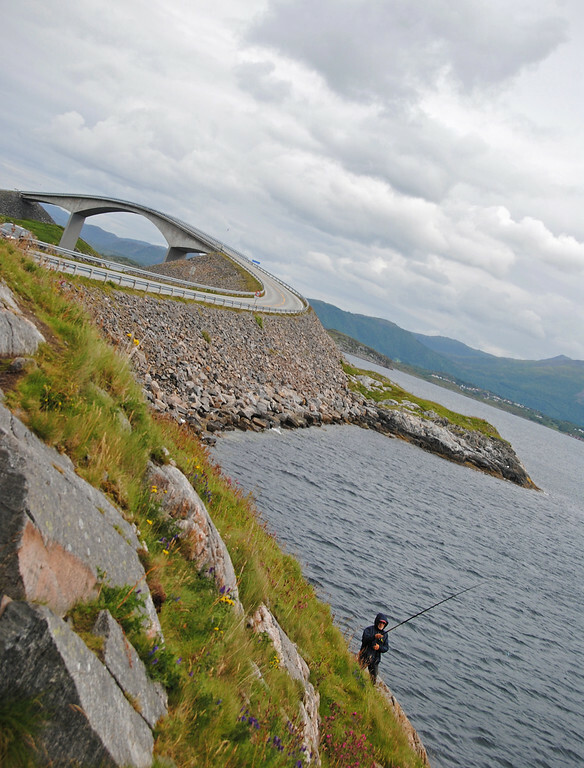 This is the first bridge to the south and it's the one that everyone knows about - the Storseisunbrua Bridge. 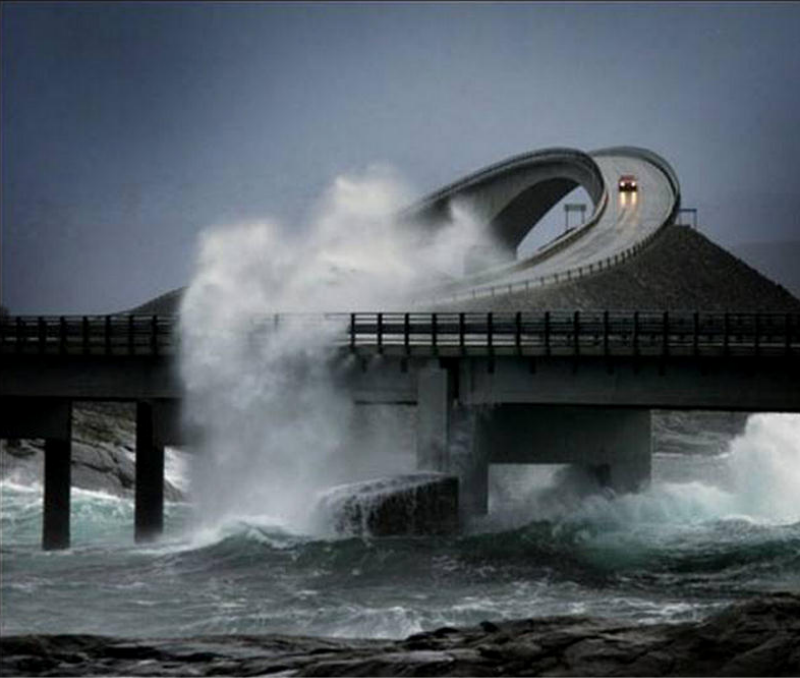 It's been written up as "the most dangerous bridge in the world", "both terrifying and awe-inspiring", "Its treacherous twists and turns, perched just above the Atlantic's unpredictable waters, make a casual drive feel like a roller coaster ride". 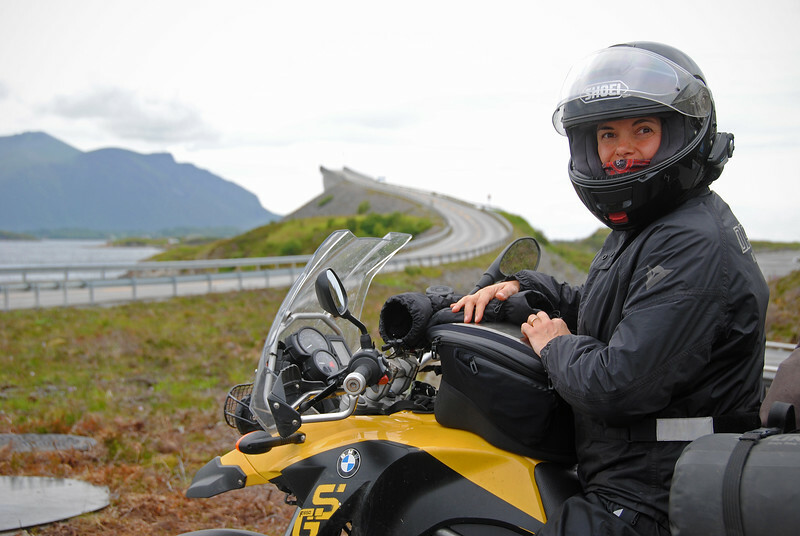 So Neda, are you ready to ride "The Most Dangerous Bridge in the World"? I want to make sure we capture this on video, so all my cameras are ready. We approach from the south, and I ready the contents of my stomach for the dramatic twist and swoop down the northern side... that never came. What?!? Where is it? Where's the drop, swoop and danger?!? Oh yeah, many people have asked me how I take those riding shots with my point-and-shoot camera. Well, now you know. After all the hype and marketing, we were very disappointed. But before leaving, I at least wanted to get a shot of the bridge from that famous, forced perspective. It turns out you have to hike over the road barriers almost out to the waters edge. Fishermen were lined on the steep shores, and that seemed way more dangerous than the bridge itself. 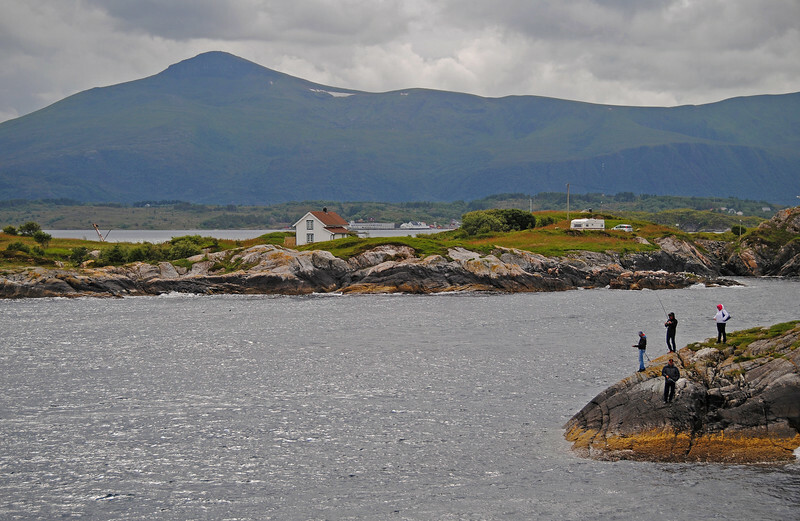 More fishermen along the Atlantic Ocean Road, risking a terrifying death-plunge into the frigid waters of the awe-inspiring Atlantic Ocean below!!! Death! Danger! Fishing! My heart can't stand it!!! 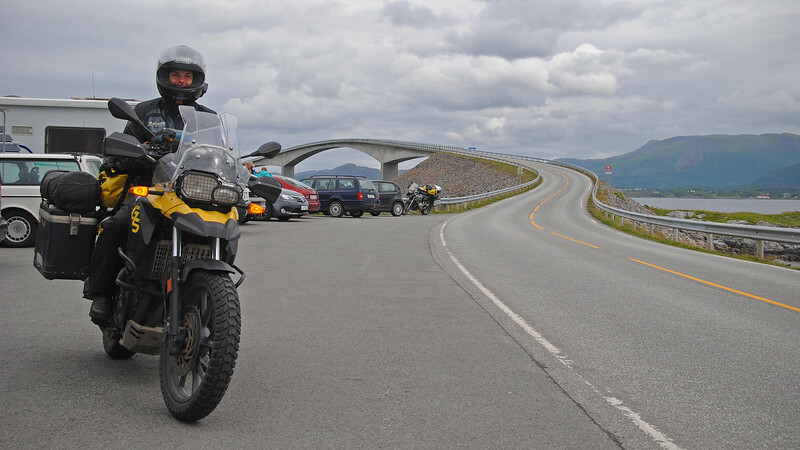 We actually rode further north to the other bridges in the Atlantic Ocean Road just to make sure we didn't miss anything. The other bridges are even more boring than Storseisunbrua. What a complete waste of time. We got off the coastal road and made a bee-line for the highway. 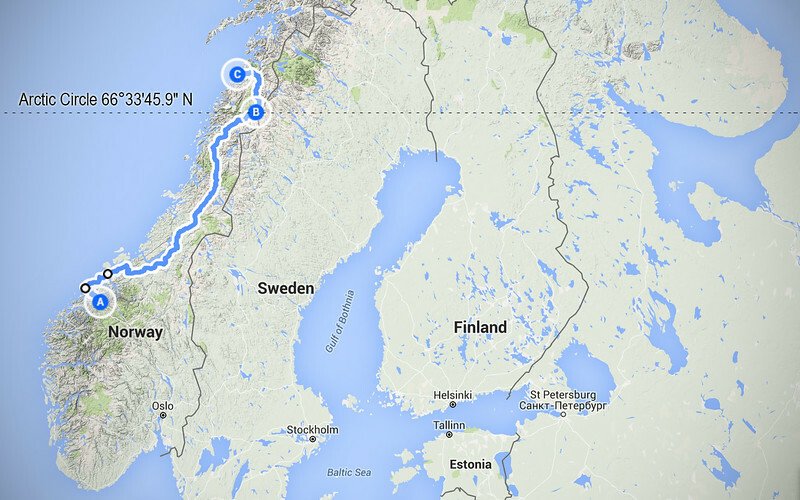 After exhausting most of the tourist attractions in southern Norway, the plan is to head far, far north now. We stopped for the evening at a campsite just outside of Trondheim and called it an early day. The next morning brought us considerably less sunshine for our long trek north. 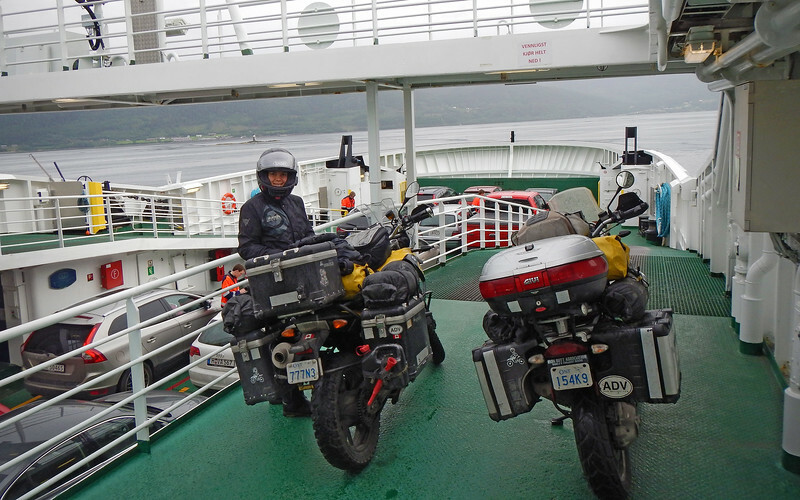 We spent about 8 hours on the highway, enduring frigid temperatures and riding through on-and-off again rain. What made us feel even more miserable is the knowledge that the rest of Europe is currently experiencing a heat wave. Neda's sister in Milan messaged us to tell us that it almost hit 40°C there the other day. And it's 10°C here. 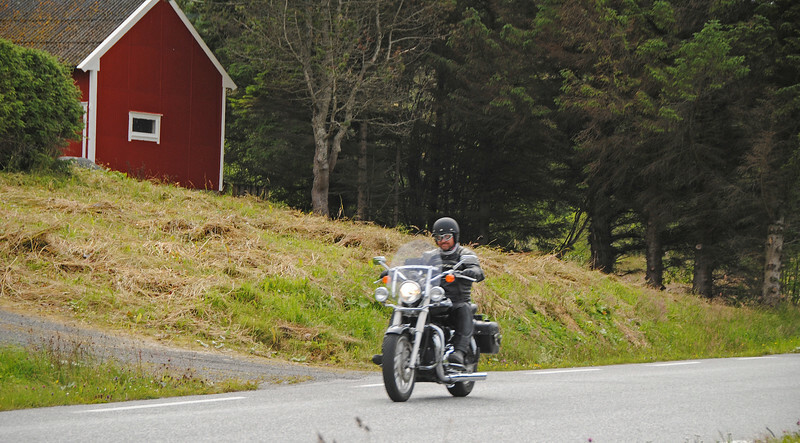 I don't have many pictures of the long, rainy ride up Norway's main highway. 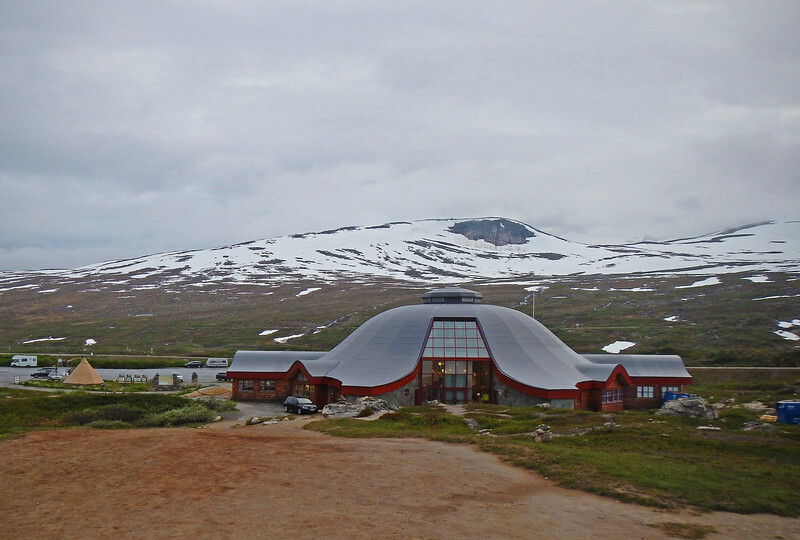 But now we've arrived at a very special place: The Arctic Circle! The elevation of the road is much higher here and the vegetation is sparse amongst all the unmelted snow patches on the barren ground. But amidst all of this emptiness is a large building and monument marking the imaginary line of latitude. The Arctic Circle is the line on earth where anything north of it is able to experience 24 hours of daylight (on Jun 21st) or 24 hours of darkness (on Dec 21st). Even though we are well past the summer solstice, we've noticed that the sun has lingered higher in the sky a lot later than it usually did even compared to yesterday, 600 kms to the south. These pictures were taken around 8PM and it was like it was the middle of the day. Feeling like we're on top of the world!!! 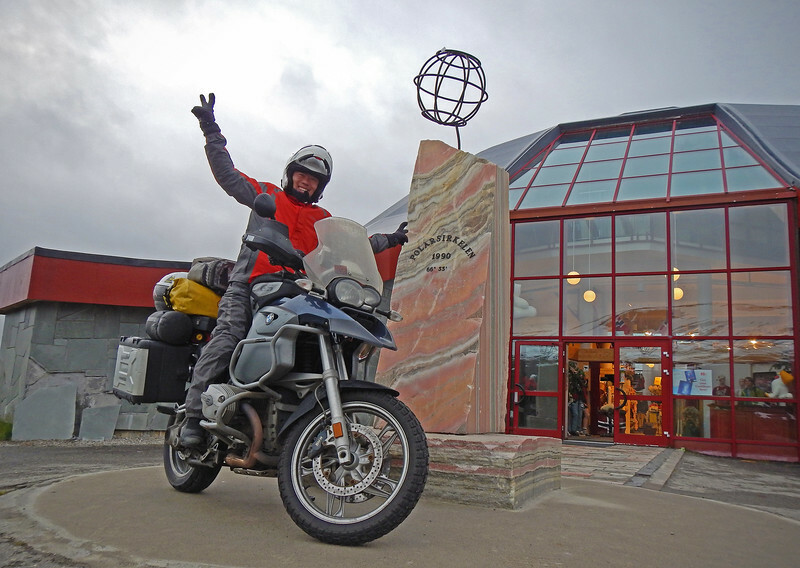 The last time we crossed the Arctic Circle was in Alaska back in August 2012 on the way to Prudhoe Bay! Man, that seems like a lifetime ago! There's something really profound about crossing lines of latitude. You become acutely aware that you're actually crawling on the face of a globe instead of a flat 2D map. 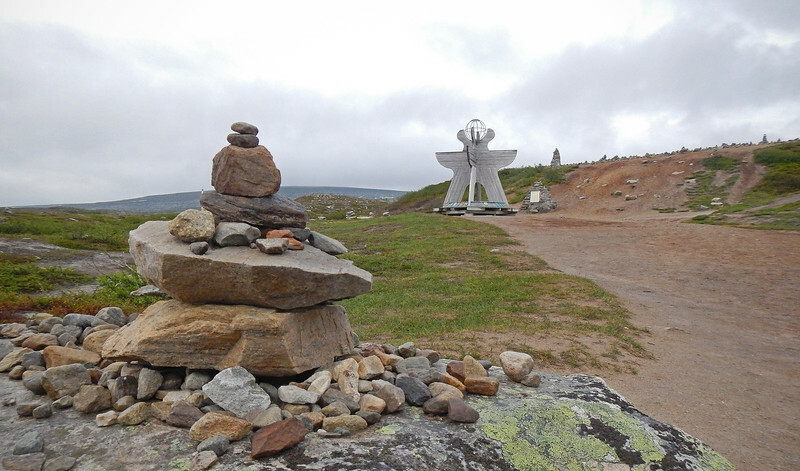 And to cross the Arctic Circle so close to the summer solstice and to see the effect that it this has on the path of the sun - you can imagine the Earth tilting through its seasons as it completes its annual orbit. It really places you in a larger, celestial context. We're a bit refreshed, mentally and physically, after crossing the Arctic Circle, as if an imaginary line of latitude has imbued us with some kind of spiritual energy to continue on. 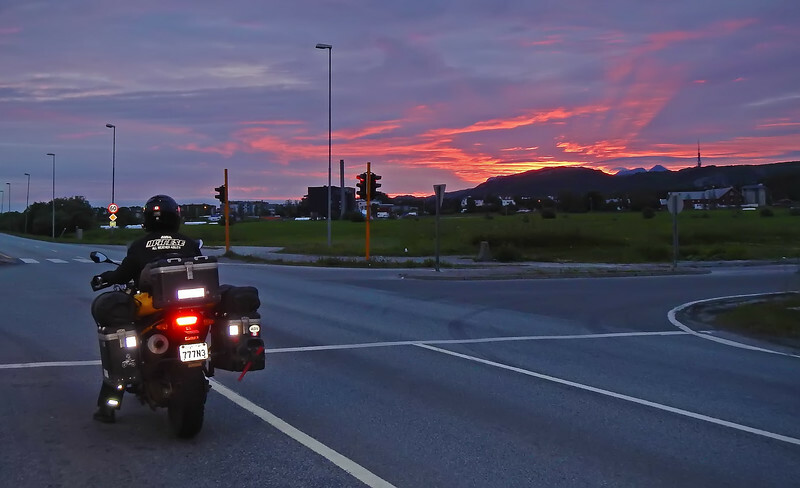 It's getting fairly late now and we have to find a campsite close to Bodø, where we're going to catch a ferry early tomorrow morning. We're feeling like maybe we should wildcamp for the night. Why spend the money to put up a tent for 8 hours when we could do it for free? 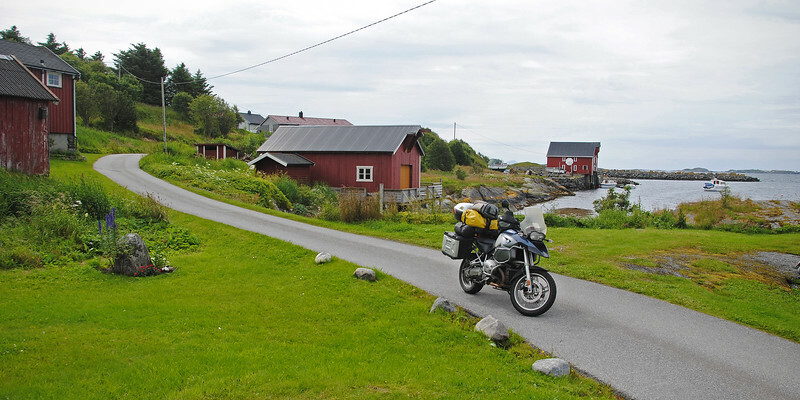 So on the way to Bodø, we keep an eye out for a spot to pitch a tent out of the way of the main road. On the way to Bodø. The sun has been threatening to set on us for hours now! Turns out that there weren't any suitable places to pitch a tent. I think too many people have the same idea as us - to try to wildcamp between the Arctic Circle and the next major town up, so they've made it intentionally difficult to do so. Two hours later, we arrive in Bodø and we have to camp anyway. Oh well. Over 700kms today. Over 14 hours on the road. We're cold and tired. It's 11:30PM and the sun *STILL* hasn't set! So strange. We're on the downhill side of the summer solstice and yet the sun is setting later and later the further north we go.